Think like a multi-tasker when it comes to small space staging. When you’re listing a smaller property for sale, it makes sense to arrange the rooms to show multiple functions, even if that’s not how you currently use them. That’s because buyers are looking for the biggest bang for their buck. More function is more value. Flexibility is key when it comes to small homes and condos. Potential buyers will have a list of the types of activities they want their new home to accommodate. 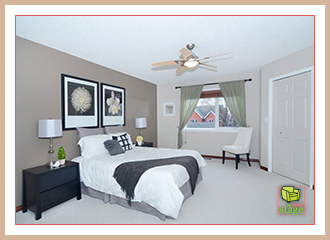 Things like a home work space, space for overnight guests, room for entertaining, and storage top many lists. If separate spaces are not available to tick off those items on the wish list, small space staging must show multiple functions. 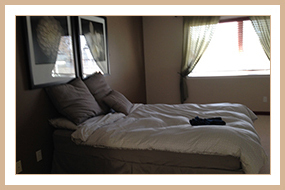 After: We made this a multi-use space by adding a work desk into the bedroom. Perfect for students! Placing a table and chair against a wall, like we did in this Victoria Park, Calgary condo we staged, allows the spare bedroom to also function as a home office, while not feeling “office-y” when guests are using it. 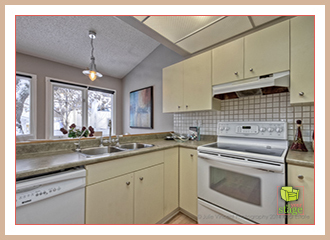 After: Some renovations and staging accessories make this Calgary kitchen look brand new! Similarly, we placed the same small sofa table/desk and bar height chairs against the wall in this high end kitchen we staged in a Mission condo, creating a spot for comfortable conversation with the cook over a glass of wine, to enjoy a casual meal, or to use a laptop. 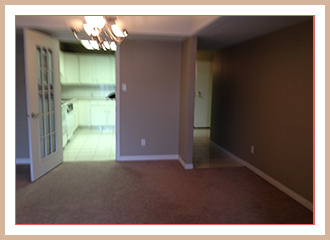 Bottom line – multiple functions are vital in small space staging. You add more value to your listing when you can show potential buyers how much of their wish list they can accomplish, even in a small space. Want to stay in touch and read more of our home staging tips? Follow Set Your Stage on Twitter. What Makes Potential Buyers Choose a Home? Potential buyers can see countless listings before they finally choose a home. While there are many factors influencing that decision, in most cases, it’s the warm fuzzies that ultimately tip the scales in the final buying decision between similar properties. 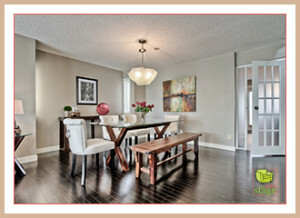 TIP: As a seller, working with a professional home stager can help you influence those emotions in your favour. 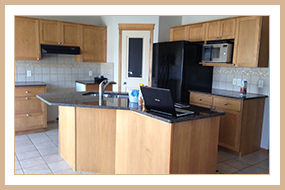 After: We staged this kitchen with bar stools and trendy accessories. I love that. Happiness lived there – and isn’t that really what we want our homes to be? Our place of comfort and happiness. 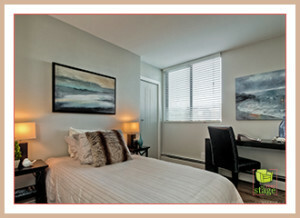 That’s why, as a professional home stager in Calgary, the power of that vibe is what I focus on every day in my work. I help my clients market the warm fuzzies that potential buyers are looking for. The marketing is key. It’s more than decorating. Different types of buyers are looking for different things in terms of what happiness looks like at different stages of their lives. 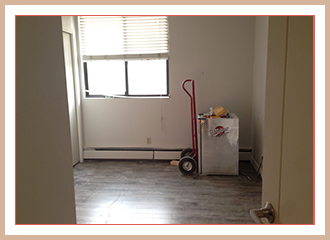 So, when you’re considering hiring a professional stager, it’s important that she has neighbourhood-specific expertise in staging properties that sell. Warm fuzzies help a potential buyer to choose a home. If you’re selling your house or condo in Calgary, I can help you with that! A lot of people love using essential oils for wellness. But have you considered using them as a tool for selling your house? Here are three tips for how you can strategically use essential oils for home staging. Personally, my preference is for homes to smell clean and fresh versus scented. That includes using plants to clean your indoor air and other more natural solutions to address odours. But if you are going to use scented products before your next open house, you might as well switch to essential oils. Keep in mind though, different people have different scent preferences, tolerances, and personal memories attached to certain scents. Proceed with that in mind and choose a “less is more” approach. Dining area before home staging. After: Using a bench as part of your dining room set really opens up the room. Tea tree and eucalyptus oils might be great for disinfecting, but they’re not ideal scents to use when staging your home. Instead, use a few drops of lemon or orange essential oil on a wet cloth to clean solid surfaces or add a scented cotton ball to your vacuum bag before you do that last minute tidy for your next open house. Ideal for stress reduction and relaxation, try a chamomile and lavender blend. Add a few drops to a spray bottle with water. Shake and spray onto rugs and linens. Promote a positive feeling of happiness when potential buyers take their first step indoors. Stick with citrus and or something soothing like my favourite Young Living scents Peace & Calming or Stress Away? Just don’t overpower them! Scent marketing is big business. Using essential oils for home staging is certainly something to consider. I know times are tough, especially around Christmas time. So when I saw a news piece recently about an increasing number of people turning to Alberta food banks for support, it was an important reminder. 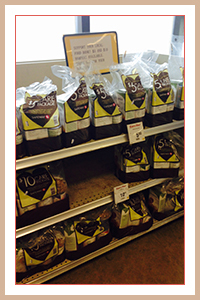 Since Safeway has an easy Food Bank Donation hamper, I’ll be making a donation to the Calgary Food Bank. 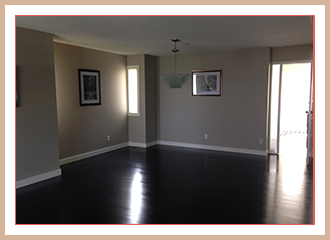 As a Calgary home stager, my job is to stage a property to appeal to the ideal lifestyle of potential buyers. 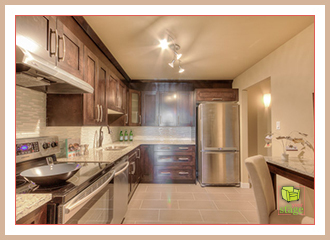 Of course, the kitchen is one of the most important rooms to include in the staging process. That’s because it’s often the hub of the home – where our closest relationships are nurtured. In the ideal lifestyle that potential buyers imagine, at no point would there be a lack of food to prepare and serve in that kitchen. So the connection to my work is not lost on me. That’s why I’m making a donation to the Calgary Food Bank, with love, and I urge you to do the same (to whatever Alberta food bank is closest to you). Did you know that last year, children made up 43% of the people who went to the Calgary Food Bank for help? And that was 6% higher than the national average? 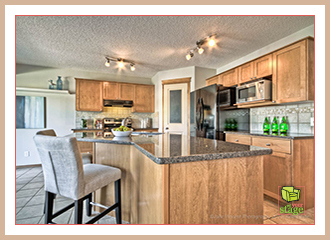 After: The pears and Perrier water help to showcase an active healthy lifestyle in this kitchen. You and I can’t solve every problem. But we CAN drop off some food or volunteer our time. Will you join me in reaching out to support the Calgary Food Bank? We can help keep the kitchen a nurturing space in every home. Please share this post with your contacts in Alberta and do your part to fill up our local food bank shelves this summer. Let’s not wait until the holidays. They need our help now. 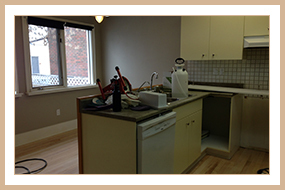 Jen Campbell is the owner of Set Your Stage, a professional home staging company based in Calgary, Alberta. She happily lives in a Sunnyside condo and shares some of the appealing features of this popular area in the “Why I love Sunnyside/Kensington” section of her blog. You are currently browsing the Set Your Stage weblog archives for December, 2015.